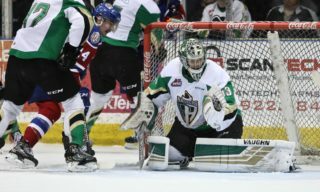 Swift Current, SK –Swift Current Broncos (5-21-1-1) goaltender Joel Hofer was the difference maker on Tuesday night as the Prince Albert Raiders (26-1-0-1) saw their 19-game winning streak snapped in a 3-2 shootout loss at the Innovation Credit Union i-plex. Hofer, a St. Louis Blues draft pick, made 52 saves on the evening and turned aside all three Raiders in the shootout to earn the win. The Raiders received points from six different players on the evening, including Brett Leason scoring to extend his point streak to 28 games. 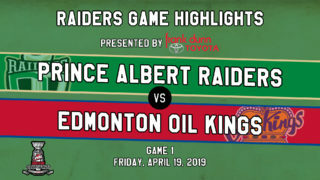 The loss was the Raiders’ first since October 6 against the Red Deer Rebels. In that game, the Raiders also eclipsed the 50-shot plateau by registering 52 shots on goal compared to Red Deer’s 21. For the first time this season, the Raiders surrendered the first goal of the game in two straight contests. With Spencer Moe in the penalty box for hooking, Andrew Fyten’s centering pass was tipped through Ian Scott by Tanner Nagel at the 7:01 mark of the frame. Midway through the frame, Brett Leason levelled the score with his 28th goal. Kaiden Guhle kept the puck in at the line and fed Leason. The Calgary product worked a give-and-go with Parker Kelly and wired a one-timer past Hofer with 10:01 to play in opening period. SCORES! @Bleason7 buries a one-timer from @Parks_17! The Raiders turned up the intensity in the second period, outshooting the Broncos 17-6 in the period. Hofer kept the Raiders at bay by stopping all of the shots he faced in the frame. In the third, Brayden Pachal finally broke through Hofer again with 8:55 to play in regulation. Spencer Moe used his speed to get into the zone and put a shot on goal. Hofer made the stop, but Pachal crashed to the net to pot the rebound for his sixth of the year. SCORES! @BraydenPachal buries a rebound! The Raiders continued to pressure in the period, putting 19 shots on Hofer in the final frame. However, it was the Broncos that scored the next goal. With 1:44 to play, Ethan Regnier forced a turnover at the Raiders’ blue line and beat Scott to tie the game and send it to overtime. In the extra frame, the Raiders controlled possession through most of the five-minute stanza. The team’s best chance to end the contest came when Leason sped down the left wing, cut in on goal and hit the crossbar with his shot. The Raiders sent out Noah Gregor, Brett Leason, and Ozzy Wiesblatt out for the shootout, but all were turned aside by Hofer. Scott stopped the first two Broncos shooters, but Regnier’s quick shot in the third round got through the Toronto Maple Leafs draft pick to hold up as the lone goal in the shootout. Scott finished the game with 21 saves through regulation to go along with the two stops in the shootout. 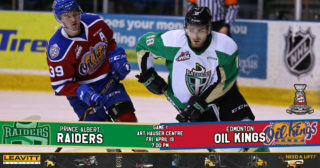 The Raiders open a home-and-home series with the Brandon Wheat Kings (13-7-3-3) on Friday night, beginning at Westoba Place. Puck drop is 7:30 p.m. 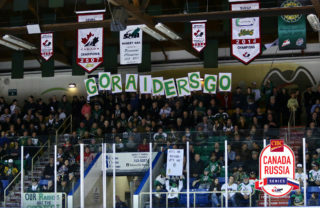 The series shifts back to Prince Albert on Saturday night at the Art Hauser Centre. Game time is 7 p.m. Tickets are still available but limited. Head to raiderhockey.com and the Raider Office to pick up tickets.